In late March we stayed on the Oregon Coast north of Depoe Bay. An interesting event occurred on the last night of our visit. The sky was extremely clear. I took a series of photos of the sun setting into the ocean. It was truly a spectacular sunset. What a nice way to spend our last night at the Coast. Great photos! And thanks for the Green Flash. Thanks John. As much as I enjoy the Gorge, I like the Oregon Coast too. I wish there was a ‘LOVE’ button for these pictures. They are all beautiful and sun on the water is among my most joyful memories of youth, when I lived on the coast. So peaceful. 🙂 Thank you for sharing, John! There is something unique and beautiful about the Central Oregon Coast, isn’t there? The green flash reminds me of Sea of Rust where the event is discussed and has some significance to the lead character. I really had no idea what the book was talking about. Now I do. Your good deed of the day! Wow! 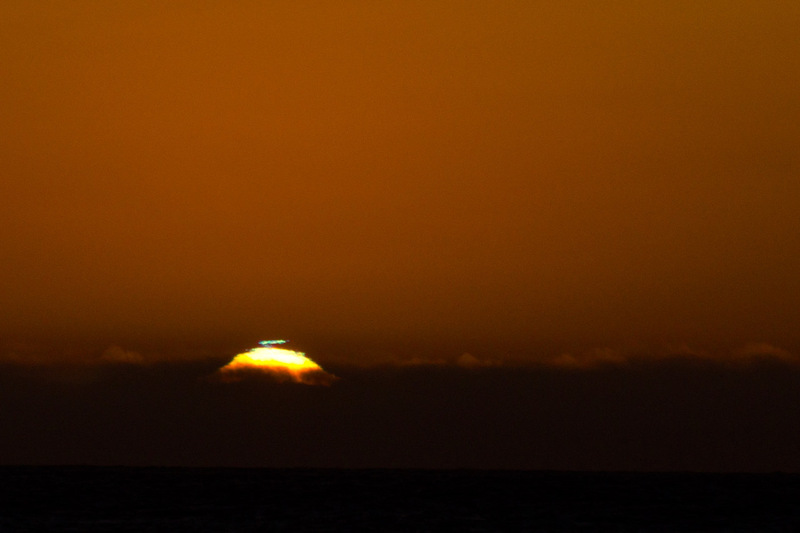 I can’t believe you caught the green flash! Great series of images. Thanks. Watching the sun set in the Pacific Ocean is always a treat.